Delivering Growth from the Core. Preparing for business growth or program success requires a strategy that is fundamental and relevant in both an upturn and a downturn. Our Business Transformation services are designed to to help each client successfully address the challenges and opportunities facing their company or project. In order to fully understand challenges and opportunities, we at Capable Core we use the left side of our strategic alignment model to quickly identify some key factors around our clients business that are driving the growth agenda. 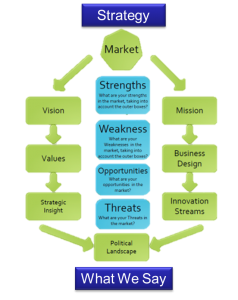 This is underpinned by the Change Readiness Assessment and SWOT analysis which addresses the strengths, weakness, opportunities and threats that are currently relevant to your growth strategy. All of the above are fundamental to a growth strategy that can be implemented and lead our customers on to a path of sustainable growth. When the strategy piece is complete the next stage is the implementation side, which looks at the following aspects of your business. 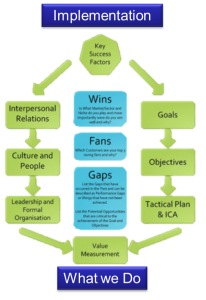 This is underpinned with an analysis of wins, fans and gaps, which quickly identifies were you play, how you win and who your fans are. which is geared towards a growth agenda.